To load a tractor tire means to fill it with liquid weight in order to keep weight evenly distributed throughout the machine. Typically, back tractor tires are loaded in order to counter act the heavy weight of front end implements attached to the tractor. Without loaded tires, the front end of the tractor would carry too much weight, which could lead to rollovers in the most serious cases. Ballasting a tractor is to use material to stabilize the heavy machinery. A properly ballasted tractor will evenly distribute its weight between the axles. This stabilization will reduce wheel slippage, which is a common cause of premature tire damage, fuel inefficiency and accidents. Ballasting can be done with cast weights, but is also commonly accomplished by loading the rear tires with liquid. If a tractor is under ballasted, wheel slippage will occur. This means that back tires, in particular, will be required to rotate more times than necessary to gain traction on a variety of soils. Excess rotations wears down the tread on tires and wastes fuel. Additionally, increased wheel slippage makes it more likely that you will dig your tires into a rut and become stuck. Loaded tires add extra weight to the tires, giving them more traction and reducing excessive rotations of the wheel. It is possible to over weight your loaded tires. If your tractor is over ballasted -- that is if you put too much weight in the tires -- your tractor will be too heavy and its performance will become sluggish. This sluggishness burns more fuel than necessary and can cause early drive train problems. The most common liquid used to load a tire is calcium chloride. Calcium chloride is inexpensive, making it a more affordable option than cast weights. You will need to calculate your tractor's tire slippage (see References) in order to determine how much ballasting your tractor needs. In general, you want to leave some space in a tire loaded with calcium chloride to accommodate any changes in volume due to fluctuating temperatures. The downside of calcium chloride is that it is corrosive and will rust rims and tire linings if there is a leak in your tire. Loading tires with calcium chloride or another liquid presents other challenges for tractor owners. Liquid can be both difficult to get into a tire, and is definitely difficult to remove. 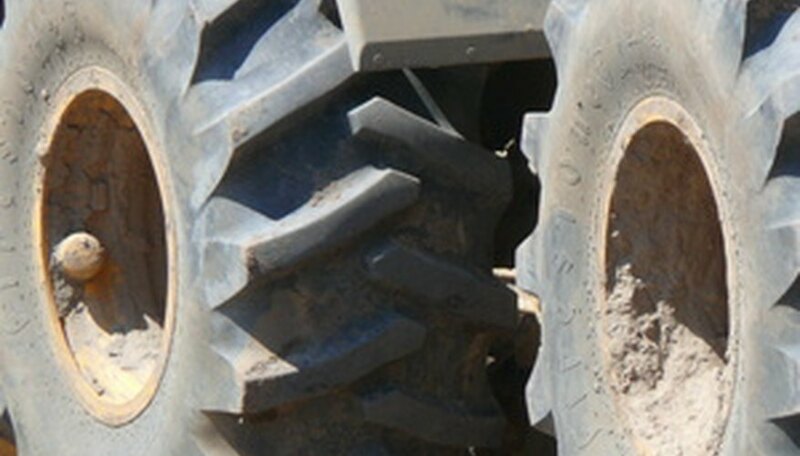 If you use your tractor for different types of activities and attach and remove implements regularly, thus constantly changing the weight of your tractor, loaded tires might not be the best option. Consider, instead, cast weights that are easier to remove when not needed. Always consult your tractor's manufacturing guidelines for proper tire inflation pressure information and the maximum weight/load capacity for your tractor.